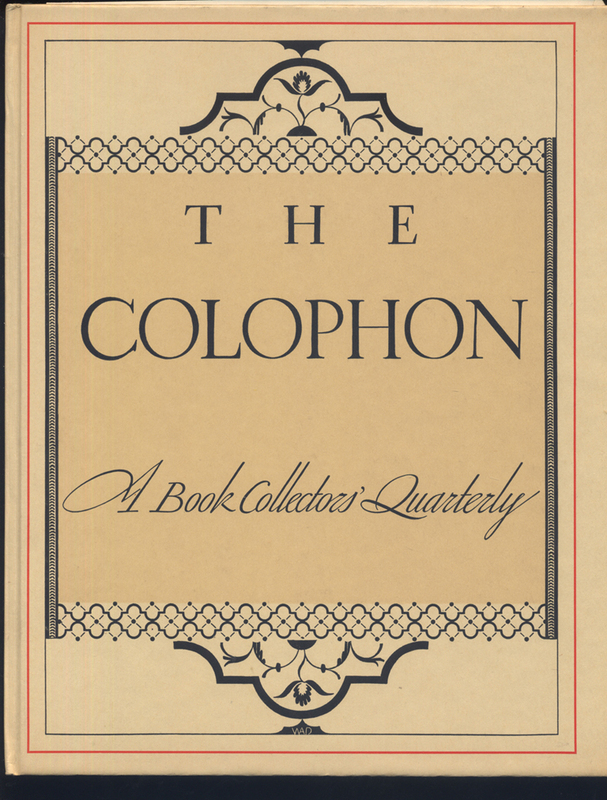 The Colophon: A Book Collectors’ Quarterly, Part V (1931). Cover design by W.A. Dwiggins. Spine for The Colophon, Part V (1931). Design, lettering and ornament by W.A. Dwiggins. Adler was eager to get Dwiggins’ response to the first two issues of The Colophon. “Why in the deuce don’t you open up and say something once in a while?” he querulously wrote him on June 10, 1930. “You might just as well be in China, for all the help you are with suggestions for The Colophon, and we really need your help.” He especially wanted suggestions of Boston printers, other than The Merrymount Press, who could contribute to The Colophon. Adler needed to find new printers of reliable quality beyond the usual suspects because The Colophon was comprised of collated inserts designed and printed by a variety of contributors. Pynson Printers, his company, merely handled the cover, title page, and colophon page. I am not much help on the Col., I admit. Output of energy rather limited. Think you are doing a top-hole job. If I appear lukewarm (I am lukewarm) it is because I haven’t an ounce of collector or bibliophile blood in my veins. I rather shy off bibliophiling for some reason—I don’t know what. I guess I don’t care much for shoptalk anyway: rather do the job than talk about it, etc., etc. Not a pose—actual fact. The only idea I ever had for the Col.—my own production I mean—was a four-page imaginary printing-news-sheet, such as I fancied would feed me the kind of food I craved. Sort of dream of the kind of periodical I might look forward to seeing so often. This notion resulted, I think, from looking at the Inland Printer, and American Printer, and that sort. I thought it would be fun to write it all myself—letters from our correspondents in Prague and Stockholm and Milan, with cuts of new type, illustrations, title-pages, etc.—editorials, news about ourselves, etc. etc. Good idea, but a fearful amount of work—maybe do it if I live long enough. 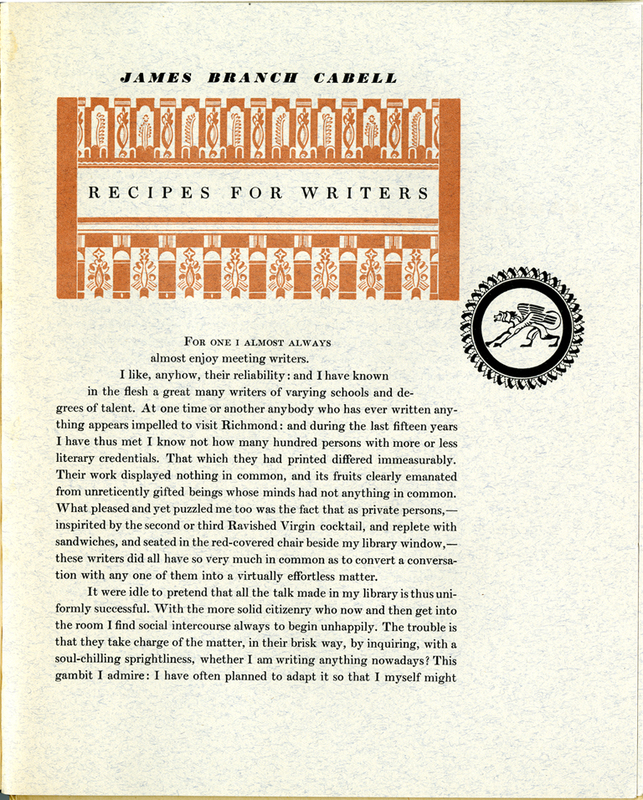 “Recipes for Writers” by James Branch Cabell in The Colophon, Part V (1931). Ornaments by W.A. Dwiggins. Image courtesy of the California Historical Society. Colophon page for The Colophon: A Book Collectors’ Quarterly, Part V (1931). Typography and decorations by W.A. Dwiggins. Image courtesy of the California Historical Society. 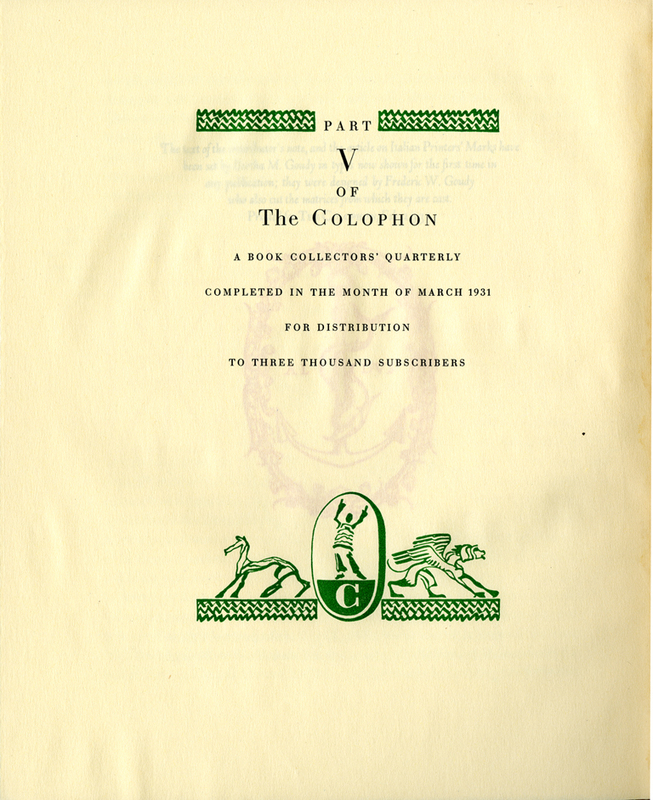 At some point between October 1930 and March 1931 Dwiggins designed the colophon for The Colophon Part V. The design is notable for its three stencil figures: a horse, a man with upraised arms, and a gryphon. These figures recur in other works by Dwiggins. The gryphon had already been used a few months earlier for the “Recipes for Writers” insert (above) and all three are present throughout his design of The Time Machine: An Invention by H.G. Wells (New York: Random House, 1931). They are in the frame of his famous double-page title design: the gryphon at the upper left, the horse at the upper right, and the man on both sides in the middle. The man is also part of the Preface decoration and the headpieces for Chapters 3, 10, and 12; while the horse and gryphon are both part of the headpieces for Chapters 4 and 5. 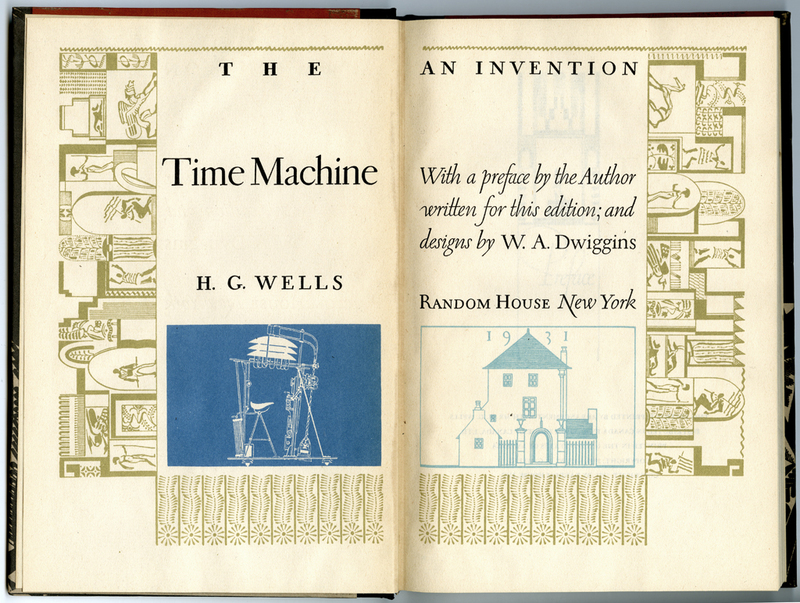 Title page spread from The Time Machine by H.G. Wells (New York: Random House, 1931). Design, ornamentation, and lettering by W.A. Dwiggins. Despite his criticisms of The Colophon, Adler kept him on as a contributing editor. Dwiggins made no attempt to resign because he knew that being on good terms with Adler and being associated with The Colophon was beneficial to his goal of leaving the world of advertising to become a full-time book designer. Four years later, forced to rethink the format and premise of The Colophon in the face of continued economic difficulties, Adler turned to Dwiggins for more than a cover design. 1. For an overview of Elmer Adler’s multifaceted life see Elmer Adler in the World of Books edited by Paul A. Bennett (Princeton, New Jersey: The Princeton University Library, 1964). Pynson Printers was founded 20 March 1922 by Adler with Hubert Canfield (1892–1969), David Silvé (b. 1889), and Walter Dorwin Teague (1883–1960), but by the fall only Adler was left. See “Elmer Adler: The Pynson Printers” by Paul Johnston in Publishers’ Weekly (March 7, 1931), p. 1184. Adler was also one of the original founders of Random House, along with Bennett Cerf (1898–1971) and Klopfer. His role in the firm ended after the Stock Market Crash of 1929. See “The Four Lives of Elmer Adler” by Frederick B. Adams, Jr. in Elmer Adler in the World of Books, p. 5; and Johnston, p. 1188. 2. My Mortal Enemy was the first book that Dwiggins designed for Knopf. Adler is widely credited with introducing Dwiggins to Knopf in 1924 and thus jump-starting their productive thirty-year collaboration. See typescript of talk by Alfred A. Knopf at “Design as a Function of Management” Conference in Aspen, Colorado, 26 June 1952, p. 5 in Folder 3, Box 666, Alfred A. Knopf, Inc. Papers, Harry Ransom Humanities Research Center, University of Texas; and “Elmer Adler: Visionary” by Philip C. Duschnes in Elmer Adler in the World of Books, p. 9. Elsewhere, though, Knopf says it was Frederic Melcher of Publishers’ Weekly who first introduced Dwiggins to him. In “Some Random Recollections: An Informal Talk Made at the Grolier Club, New York, 21 October 1948” by Alfred A. Knopf (New York: The Typophiles: Typophile Chapbook XXII, 1949), p. 6 he says Melcher made the introduction in 1922. The year must be a mistake since “Tribute to a Designer, Dwiggins” by Alfred A. Knopf, an insert in the Christmas issue of Esquire (December 1958), says the meeting took place in 1923, citing his diary entry for 17 September 1923: “W.A. Dwiggins brought to office by Fred Melcher.” See Folder 132, Box 31, W.A. Dwiggins Collection 2001, Boston Public Library. But Knopf fudged his diary entry. The actual entry, kindly provided to me by Richard Watson, Head of Reference and Research Services at the Harry Ransom Center, says, “Had a very pleasant visit from Dwiggins who was brought around by Melcher.” See Box 621.2 in the Alfred A. Knopf, Inc. Papers, Harry R. Ransom Humanities Research Center, University of Texas. 3. See Elmer Adler to W.A. Dwiggins, 24 October 1928 in Box 1, The Colophon Papers, New York Public Library; and 17 December 1928 report on progress of The Colophon in Box 173, Random House Files, Columbia University Rare Book and Manuscript Library. Orton, then on the advertising staff of The American Mercury, was supposedly Bennett Cerf’s choice for editor of The Colophon, but Adler chose Emmett, vice-president of the Newell-Emmett Company, an advertising agency. See Trading Words: Poetry, Typography and Illustrated Books in the Modern Literary Economy by Claire Hoertz Badaracco (Baltimore and London: The Johns Hopkins University Press, 1995), p. 186. 4. See W.A. Dwiggins to Donald S. Klopfer, 26 April 1929 in Random House files at Columbia Box 165, Folder—Stevenson, Robert, Dr. Jekyll and Mr. Hyde, Random House Records, Columbia University Rare Book & Manuscript Library. 5. For an overview of the fine printing mania of the 1920s see Beauty and the Book: Fine Editions and Cultural Distinction in America by Megan L. Benton (New Haven and London: Yale University Press, 2000). Although Benton’s account of Dwiggins’ activities is flawed, her overall portrait of the period and its players is informative and entertaining. 6. See Elmer Adler to Frank Altschul 17 September 1929 and Adler to Altschul 10 December 1929 in Folder 3A, Overbrook Press, Frank Altschul Papers, Columbia University Rare Book & Manuscript Library. Regarding Altschul’s financial support, also see Burton Emmett to Altschul 2 January 1931 in Folder 62, Overbrook Press, Frank Altschul Papers, Columbia University Rare Book & Manuscript Library. 7. W.A. Dwiggins to Elmer Adler 11 December 1929 in Box 1, The Colophon Papers, New York Public Library. 8. Elmer Adler to W.A. Dwiggins 22 September 1930; Dwiggins to Adler 10 October 1930; Adler to Dwiggins 29 October 1930; and Adler to Dwiggins 3 November 1930 in Folder D 1930–1931, Box 6, Pynson Printers Collection, New York Public Library. And Adler to Dwiggins 30 October 1930 and Dwiggins to Adler 3 November 1930 in Box 2, The Colophon Papers, New York Public Library. The cover for Part I (February 1930) of The Colophon was by Edward A. Wilson, but Rockwell Kent’s purported cover design never appeared. Instead the cover for Part II (May 1930) was by Joseph Sinel, the cover for Part III (September 1930) by Gustav Jensen, and the cover for Part IV (December 1930) by Donald McKay. For a complete list of the cover artists for the twenty issues that comprise the First Series of The Colophon (1930–1935) see the Wikipedia entry. 9. Elmer Adler to W.A. Dwiggins 10 June 1930; Dwiggins to Adler 2 July 1930 in Box 2, The Colophon Papers, New York Public Library. It is unclear why Dwiggins did not want to work with the McGrath-Sherrill Press. He had collaborated with the firm in 1925 on an insert for a District of Columbia Paper Manufacturing Company promotional book and in the years between 1916 and 1919 on several advertising jobs. Perhaps there had been a change in the company’s management. On the other hand, Dwiggins had previously worked with Gehman Taylor on The Sinner by Watson Gordon (1927), a small booklet designed as a Christmas gift for the author’s friends and clients, and apparently enjoyed the experience. He subsequently worked with the printer on several projects in the 1930s and 1940s. 11. Bennett Cerf was willing to take a chance on Gordon-Taylor Inc. as the printer of The Time Machine because he had become fed up with slow work and high prices of Pynson Printers on previous Random House projects, including the Strange Case of Dr. Jekyll and Mr. Hyde (1929). See for example Bennett Cerf to Elmer Adler 23 March 1929 in Box 165, Random House Files, Columbia University Rare Book & Manuscript Library; also many letters in Random House 1929–1932 Folder, Box 18, Pynson Printers Collection, New York Public Library (e.g. Cerf to Adler 20 June 1929: “…I consider the enclosed bill for ‘Jekyll and Hyde’ plates thoroughly absurd.”). 12. W.A. Dwiggins to Elmer Adler 19 October 1930 in Box 2, The Colophon Papers, New York Public Library.